This is probably by far one of the habits I need to consistently remind myself to do on a daily basis. 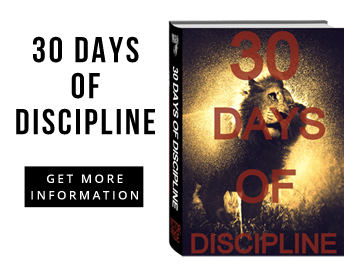 In the 30 days of discipline program you are asked to also maintain correct posture and maintain eye contact with everyone you come across. I spend a lot of time in front of a computer and this includes sitting in an office chair most of my day between being at work and being at home. A few bad habits that I have struggled with myself are getting accustomed to keeping my chair on the lowest setting possible while also either letting myself lean really far down into the chair. I will also find myself slouching a lot. Both of these are bad for my back and are not good at all. Another bad habit I have is when driving my car I tend to lean my left shoulder up and my right shoulder down. This has mostly just become habit because I drive a manual and find myself leaning down to shift commonly. I make this posture worse if I hold my left hand on the top of the steering wheel while driving, this practically shifts my entire body. When it comes to eye contact I’ve already gotten a lot better about this over the years, when I talk people face to face I generally try to maintain eye contact. Although often times I won’t hold my head high or stand up as straight as I could be when say roaming a hall in the work place. What am I doing to help correct posture and improve eye contact? Generally I find myself sitting in a poor position in my desk so I’ve so far raised my chair in both the office and at home. If I catch myself sitting poorly I constantly remind myself to correct my posture. In the car I constantly remind myself not to use my left hand on the top of steering wheel, I’ll hold the bottom of the wheel with both hands towards the center allowing me to keep a straight posture while driving. With eye contact I’ve also been reminding myself to do the same thing, I try to maintain eye contact when casually chatting with people at work and when I roam around hallways I keep my head high and don’t look down to the ground.